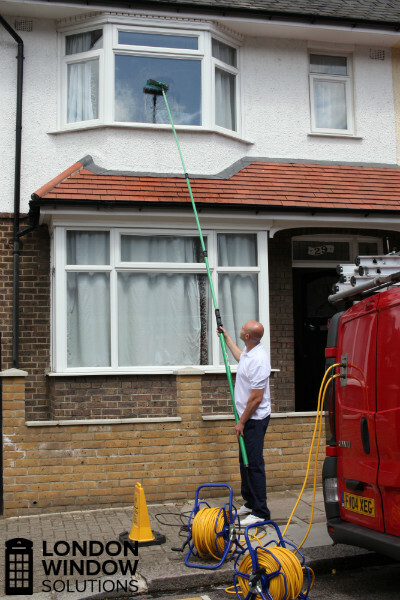 Do you need a high quality yet affordable window cleaning service in London? We’re the perfect choice for you whether you're in a commercial or domestic property. Hire us today and get all your windows, frames and sills professionally cleaned. You’ll benefit from our special water fed pole cleaning method, which gets great results without using any harmful detergents. 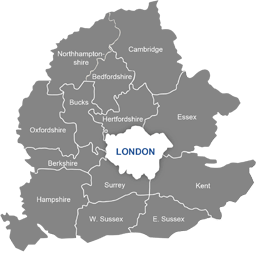 Whether you live in London, the South East of England or beyond we’re here to help - get in touch any time 24/7! Flexible time slots: we'll work around your busy schedule - all we need to do our job is sunlight! Please note that our discounts are only for residential properties, for commercial properties we’ll need to arrange a viewing. If you schedule us into your calendar on a weekly basis you’ll get a -50% cost reduction, while fortnightly appointments give -50%, monthly -35%, every 6 weeks -30%, bi-monthly (8 weeks) -25% and -15% every 3 months. Finally, if you book us every six months you’ll receive a 5% discount on our regular window cleaning services. Keep your glass streak-free and clear ongoing by booking a slot with our professional window cleaning team in London. You can get us to clean a number of different types of window, such as sash, small, and big bay. Any below the fourth floor of your building will be washed using a water-fed pole. This pole is 22m tall, telescopic and made of carbon-fibre. It’s attached to a supply of special purified water in our van – as a result, we’ll need a parking space within 30 metres of your building on the same side as the windows you want us to wash. The water will remove all the dirt, chemicals and minerals on your glass, and if used continually will sterilise them. Once in position, the team will proceed to pump the water from our van, through the hose, up the pole and then out the brush-head. An experienced cleaner will then expertly and carefully clean your glass. After that’s done your service will have concluded. There’s no need for us to dry your windows, since purified water contains no minerals and therefore won’t leave any deposits! Any internal cleaning you may require will be completed using a traditional squeegee and ladder. Please also be aware that no other maintenance work can be carried out on your property while we're working. Got high-rise windows? The team has been specially trained in the art of rope access – it involves us descending from the roof of your building using proven climbing gear. Take note that it makes scaffolding and aerial work platforms unnecessary. Once at your windows we’ll be totally suspended by harness. This enables us to clean your glass carefully while sitting comfortably! This technique is a must for any windows that are more than four storeys high. 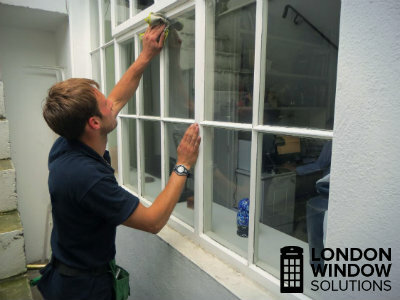 Same-day jobs – when you need an expert service urgently, London Window Solutions will deliver!